Fossil fuels: Metabolic energy buried in the rock record. Flowing water: Energy of the sun-powered hydrologic cycle. Wind: Energy of sun-powered air currents. Human use of the wind as an energy source is the topic of this lecture. Wind powered industry (windmills and wind turbines). Security: For a society to rely primarily on the wind (for locomotion or industrial power) it must be secure and very well ordered. If it isn't, wind power can only serve as an auxiliary source. Unpredictability: The limiting factor of wind use: Wind power is unpredictable and intermittent. Sometimes there is not enough. Sometimes there is too much. The industrialists of the mid 20th century didn't envision that by selling labor-saving household devices (washing machines, vacuum-cleaners, dishwashers, etc.) they were setting the stage for the massive entry of women into the professional workforce. Any time we contemplate technologic change, we have to consider its indirect consequences. The history of humanity's use of wind power is full of object lessons. To go downstream one need only drift. Most of the arable land in Egypt is within a day's walk of the river. Note: Many contemporary sailors are obsessed with sailboat racing. Races typically follow a triangular course so that at some point, the contestants must sail upwind. Thus, modern vessels tend to be optimized for sailing upwind fast, yielding boats with tall narrow high aspect-ratio sails. In the age of commercial sail, this was not such a great priority, so naval architects were happy to trade off fast upwind sailing for rigs with high overall speeds. 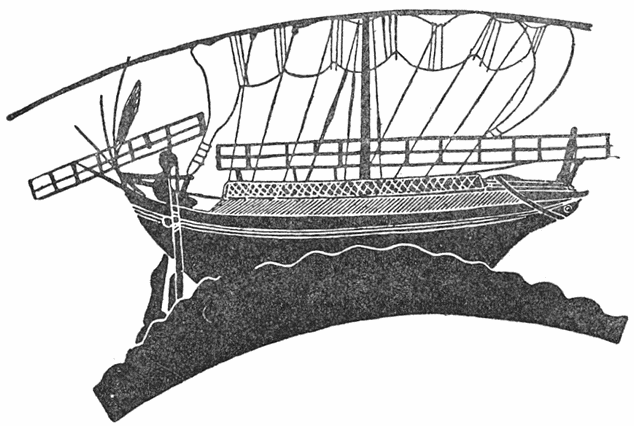 Future shock I - 6th century BCE: Consider that the rise of shipping in the Mediterranean occurred at the end of the "bronze age," however bronze (an alloy of copper and tin) remained an important commodity. At this time, Celtic communities of northern Burgundy became prosperous as middle-men along the trade route between the Mediterranean (source of quality manufactured goods) and Cornwall (southwestern Britain - source of tin for making bronze.) These Celtic towns, situated at transshipment points between rivers flowing into the Mediterranean and the English Channel, cashed in on this trade until the Carthaginians discovered the direct sea route to Cornwall during the fifth century BCE. 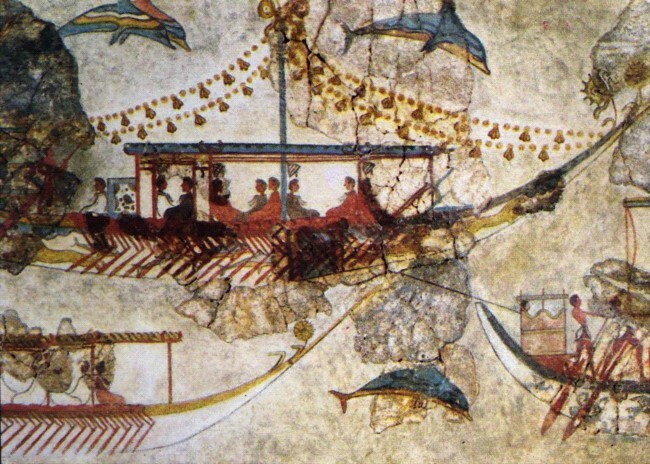 Thus, the rise of wind-powered shipping drastically altered traditional economies and benefitted societies like Carthage at the centers of shipping networks. Reconstructions teach us the limits of ancient vessels. 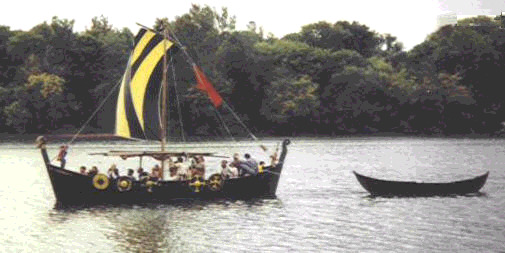 Merck's guilty secret: For a time in the 1980s he sailed with the Viking Longship Company, Ltd. aboard the Fyrdraca (right). The Fyrdraca can sail to windward (poorly - maybe 75 degrees from windward) and can tack, but does both slowly and clumsily. Moreover, it requires an absolute minimum crew of four (but really needs six or more for comfort). It does sail straight downwind like a dream. A similar sized modern boat could normally be sailed by two and can be kitted out for single-handing. Min of the Desert required a crew of 24. Their societies were not usually run according to tight schedules so mariners could wait for agreeable wind conditions. A bigger problem was coping with too much wind. One could sail in strong winds by reefing or tying off part of your sail but this only helped a little. 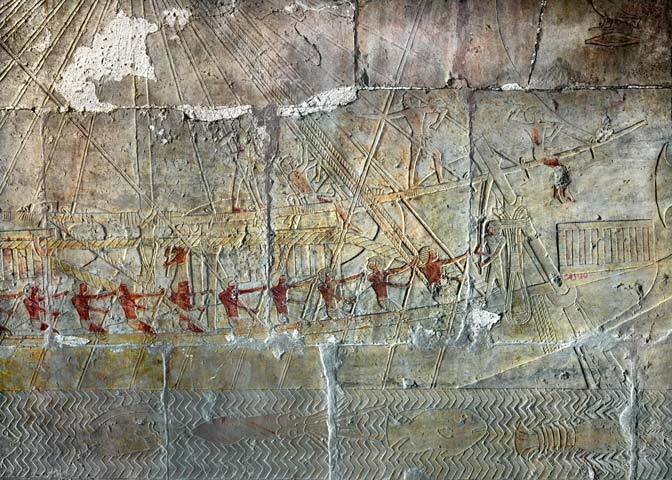 Often, heavy weather simply made navigation impossible. Security: Although we often distinguish ancient commercial ships and warships, the ancient Mediterranean was crawling with vessels that were a little bit of both (E.G. : "Sea-People" aka Philistine ship, right). This was because any vessel venturing out of home waters was likely to have to defend itself against pirates. 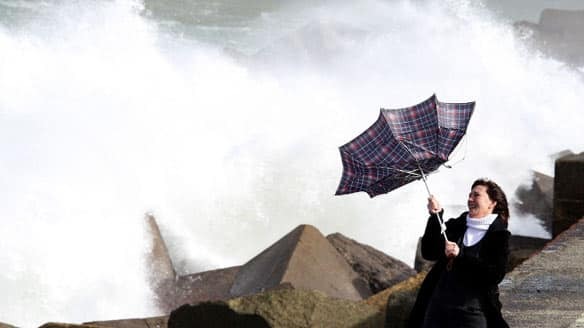 Wind - During stormy weather or calms, they could not sail. Security - they would have been helpless against pirates. 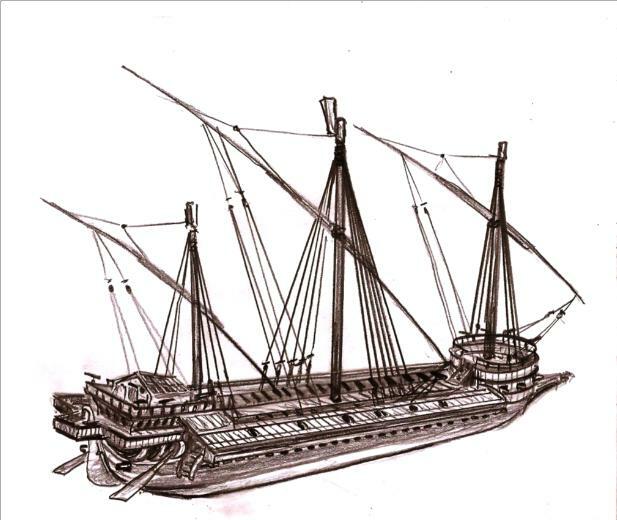 During the Middle Ages, Western and Chinese (right) maritime technologies slowly progressed, but the basic logistical constraints of wind-driven transport remained the same as they had been for the Romans. During the 15th century, the rulers of the Ming Dynasty "retired" China from major maritime commerce at the point at which Western sailing tech was about to make significant progress. quickly outclassed by sailing adversaries that bristled with guns and couldn't be approached from any direction, even in a dead calm. 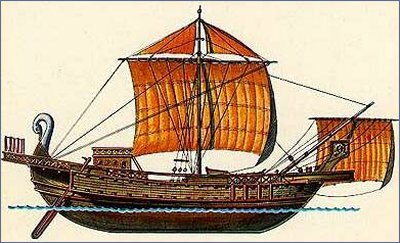 Navies traded maneuverability for fire-power, producing warships that were as dependent upon the wind as Roman grain ships had been, leading to the world's only navies of competent, purely sail-driven warships between the 15th and 19th centuries. During battle, rigging and sailors were terribly vulnerable (as in the combat of the Bonhomme Richard and Serapis, right). Were they effective? Apparently so. By 1800, the worlds oceans were as secure from piracy as the Mediterranean had been during the Roman Empire. The tradeoff: Pure sailing was no longer a choice, and navies had to learn to cope with the vagueries of the wind. As a result, navies longed to reclaim the freedom that auxiliary oar-power had once given them. So, it was no surprise that, when steam engines became available as an auxiliary power source, navies scrambled to use them. By the time of the Civil War, a first rate warship like the CSS Alabama (right) would cruise under sail but fight, or maneuver in port under steam power that turned a propeller. 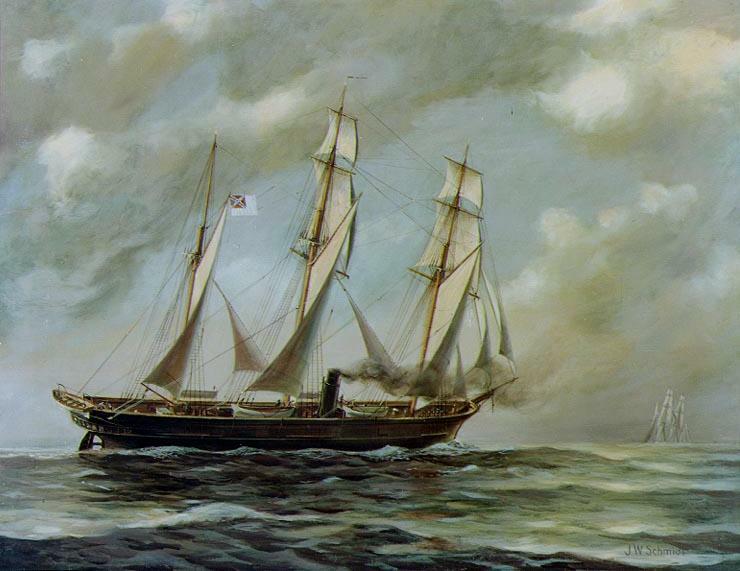 For sea-going commercial vessels that could expect tug-boat service in port and didn't need to be weighed-down by a steam engine, pure sail remained the standard. Future shock III - steam engines need fuel: In the mid-19th century, pure steamships were limited in range because of their need for fuel, and were used near the coast and on rivers. Still, the deployment of ironclad steam warships during the Civil War got navies thinking about the desirability of ocean-going steam ironclads. The problem: Steam warships consumed prodigious amounts of coal and needed frequent resupply. The first ocean-going ironclad crossed the Atlantic in 1864, but such a ship could do little upon arrival until refueled. Alas, as armor and guns became more powerful, warships with sailing rigging were increasingly vulnerable, but switching navies over to steam power would require nations to develop global networks of well defended fueling stations. The HMS Captain 1869 (right) represents the last serious attempt by any navy to build a fully modern sailing warship. Its innovative design separated the gun turrets and rigging on separate decks. Unfortunately its design and construction had been poorly supervised and it was heavier and had a higher center of gravity than planned. It capsized and sank in heavy weather during its first year of operation. This event did for the image of sailing warships what the crash of the Hindenburg did for that of airships. The global powers took the steam plunge, with cascading effects. Global imperialism went from being an economic convenience to a military necessity. 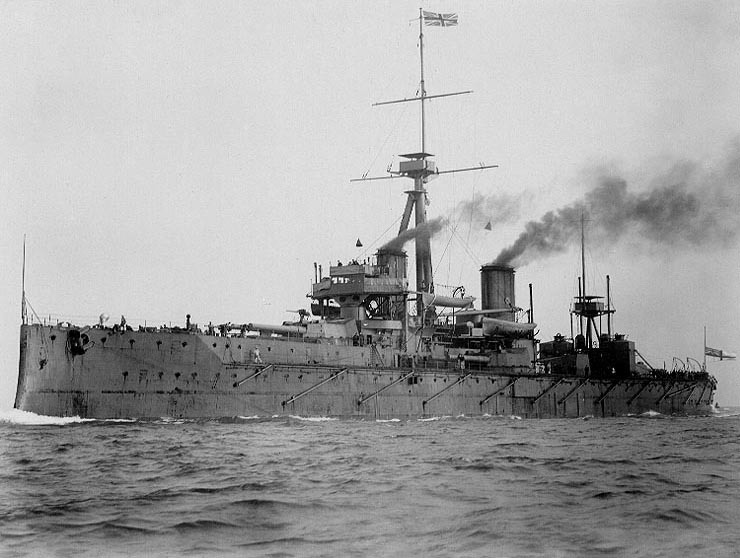 Power warships and the price of strength: By the 20th century, naval ships (E.G., the HMS Dreadnought - right) were powerful steam-powered steel-hulled monsters. But there was a price for this modernity. Consider: In WWII, the Bismark, one of the most powerful battleships ever built, on its first combat mission, was severely limited in its operational scope and ultimately trapped and destroyed because of its need to reach a friendly port for refueling. 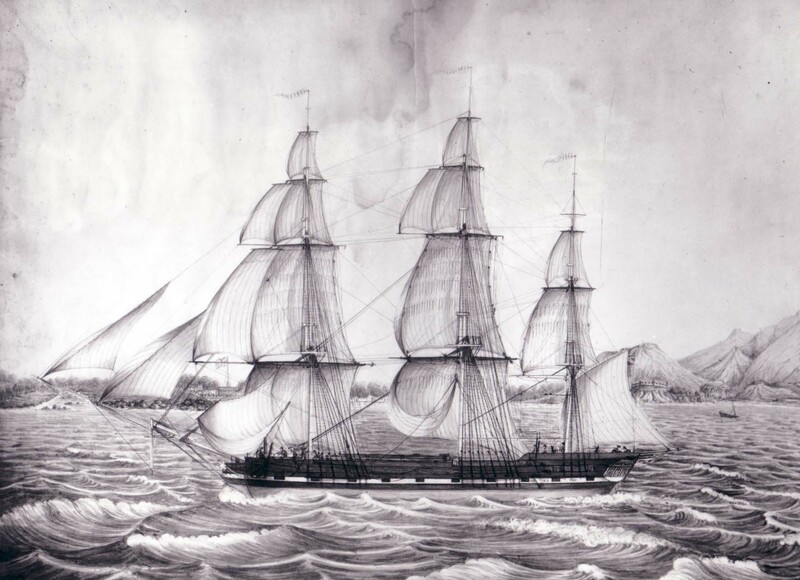 Compare that to the CSS Shenandoah, which was operating in the north Pacific when its crew learned of the end of the Civil War, then sailed non-stop and undetected by U.S. authorities to surrender to the British in Liverpool. Sailing commerce and security II: The switch to steam-powered warships didn't effect sailing commerce. Indeed, the Thomas W Lawson (right), the largest pure sailing vessel in history, was launched in 1902. 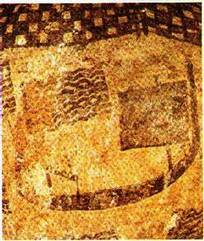 As in the ancient Mediterranean, however, sail-propelled commerce required security. The breakdown of global security in World War I put an end to such vessels, which were very easy visible targets for steam warships and submarines. In response, freighters became steam or petroleum powered, for rapid passages and in WWII, to keep up with convoys. The wind is an intermittent resource. For large scale sailing commerce requires secure sea lanes and, hence, the support of a stable and well ordered society. Sailing commerce was doomed during the early 20th century by the availability of non-intermittant energy alternatives and the insecurities of two world wars. We will see that the wind as a source of electrical power suffers from analogous limitations. But the wind is an intermittent resource. The industrial age provided alternative power sources to grain mills, but for tasks that didn't have to adhere to such exacting schedules, wind mills and wind turbines continued to predominate. The lightweight Aeromotor windmill was introduced in 1888 for pumping water, and is still in production in more or less its original form. Its use is favored, however, in places where electricity is not as readily available. The wind as a source of electricity: 1888: Within a decade of the Edison's invention of a practical incandescent light bulb and well before widespread electrification, Charles Brush built the first electricity generating wind turbine in Cleveland, OH (right). By the 1930s (i.e. before widespread rural electrification but after electrical appliances were available) Aeromotor-type windmills were frequently used for electricity generation (5-25 kW) 1 kW=1.34 hp). These were largely discontinued when electrification connected farms to reliable power grids. Thus, in their earliest form, wind turbines were in competition with more reliable sources of electrical power. The Smith-Putnam wind turbine, the first megawatt-sized turbine, was the first wind turbine to contribute to an electirc power grid, being connected to the Vermont grid in 1941. Modern wind turbines appear in the 1980s: The petroleum supply shocks of the 1970s stimulated interest in alternative energy resources during the pivotal 1980s. Resulting in the development of new wind turbine concepts. I defer to a student group, who will present technical details and discuss the utility of these machines. Issues with wind power: Basically similar to those of commercial sail, but with some twists. Coal plants will be off-line 44 days. Nuclear plants will be off-line 36 days. The problem for wind is predicting when this will be. For wind power to contribute a major portion of a region's power, the electric grid must be sufficiently well integrated and managed that the contributions of several farms can be integrated and averaged. Moreover, demand for electricity is intermittent. The output of a coal or nuke plant can be scaled to anticipated demand, but not the wind. 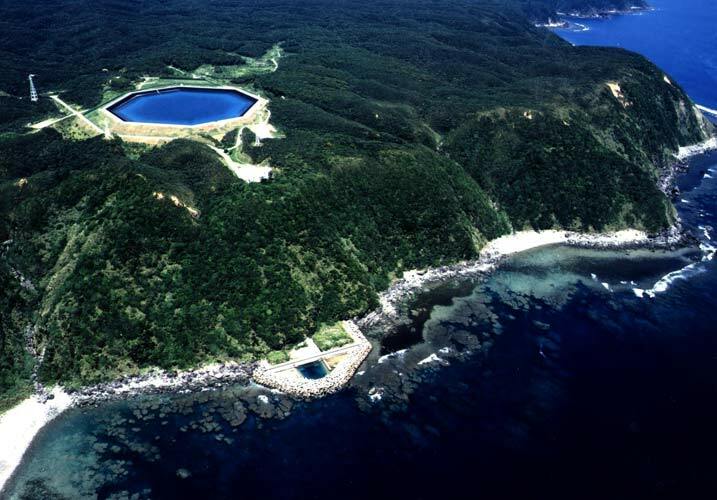 Pump storage: During periods of peak production, wind-generated electricity is used to pump water uphill into a reservoir. 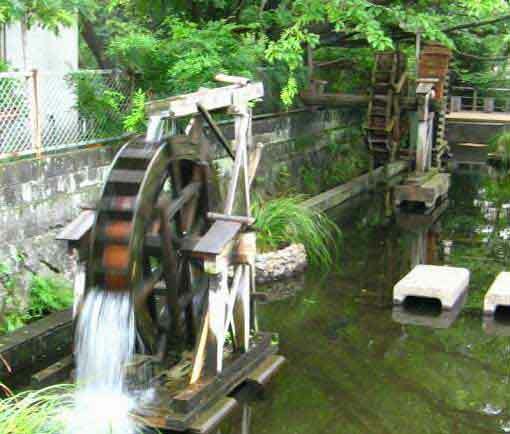 During slack production, that water is released to create hydroelectric power. Compressed air storage: During peak production, electricity is used to pump air into underground reservoirs. 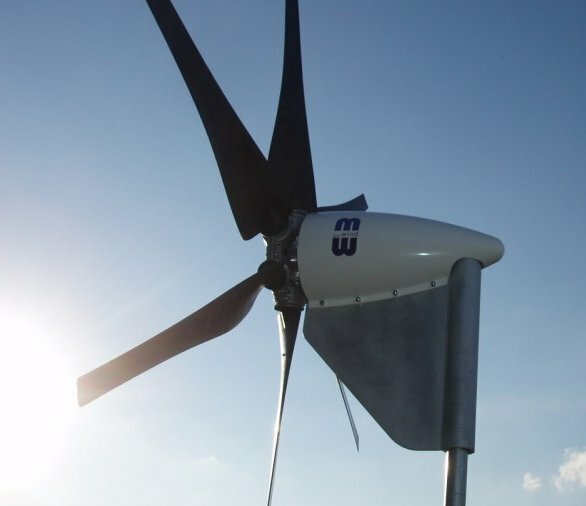 At slack times, the air is released to drive turbines for generating electricity. Next generation lithium-ion battery storage. Facilitated by advances in battery technology. Widespread integration of grids: Averaged over large areas, wind power becomes less intermittent. Thus, electric grids capable of moving power over large regions would facilitate its effective use. Development of robust grids: As the 2012 Indian blackout and the 2003 Northeast blackout demonstrated, fragile grids can fail in spectacular cascades. A grid that is robust to the kind of failures and surges that caused the 2003 blackout and resistant to national security threats will inherently be able to accommodate the fluctuations of wind energy supply. Revising institutional cultures: Engineers trained to manage the grids of the last century have often been reluctant to consider renewable energy resources because of their intermittence. Consider the Xcel utility of Colorado, that fought against a voter initiative to boost renewable energy resource capacity to 10% of output. Having lost, they met the benchmark set by the initiative eight years before schedule and now embrace its goals. Colorado has recently adopted a more ambitious plan to obtain 30% of power from renewables by 2020. Mortality in flying vertebrates: Wind turbines are absolutely known to kill birds and bats. 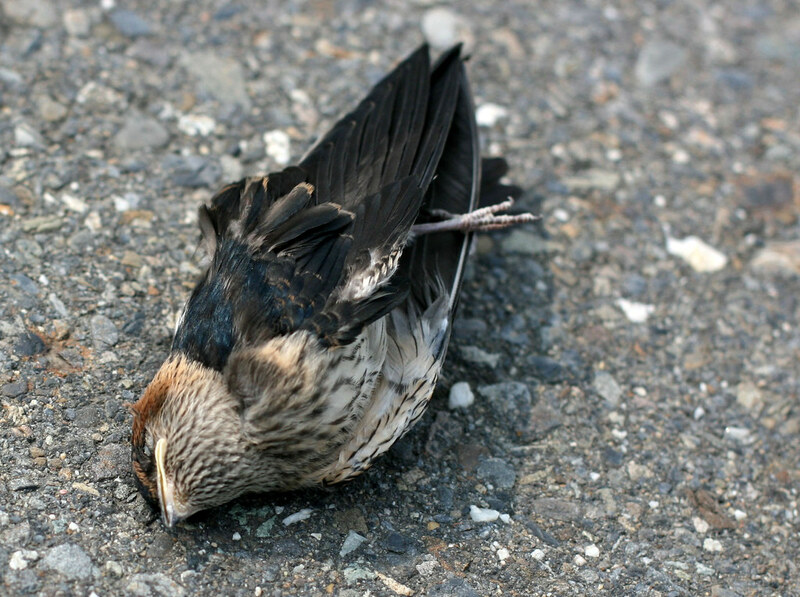 A study by the National Academy of Science showed that in 2003, 20,000 - 37,000 bird deaths were caused by wind turbines. Compared to the hundreds of millions caused by collisions with skyscrapers and high tension lines, and encounters with cats, this seems trivial but doesn't let wind farms off the hook. Notably, of the deaths cited, all but 9,200 occurred in California, home to some of the oldest wind farms. Facilities like the Altamont Pass Wind Array employ older, high RPM turbines cited along migration routes. More modern machines with slower moving but larger blades and better siting standards can improve the situation. Bats are typically active during low wind conditions, such that bat mortality could be avoided by shutting wind farms down when they are least effective. Alternatively, bat-repelling acoustics could be identified and incorporated in future wind turbines. Noise: Wind turbines have a reputation for noise that is infinitely debated. Modern upwind-facing turbines seem to be very quiet. Obviously different designs have different potential for making noise. How bad is the problem? A recent study by Lawrence Berkeley National Laboratory study indicates that proximity to wind farms has no impact on property values. How bad can it be? Patterns of political influence will change: Authors Galbraith and Price describe the growth of Texas, ground-zero of the petroleum industry, into the nations number one producer of wind power in a new book. How will this fact effect the political influence of the petroleum industry? Patterns of dependence on imports will change: Hawaii, long dependent on imports of fossil fuels, is a leader in clean energy alternatives. Major wind farms are already in operation, and a 2010 study by the National Renewable Energy Laboratory projects that Hawaii has the capacity to supply 100% of its energy needs using wind power. 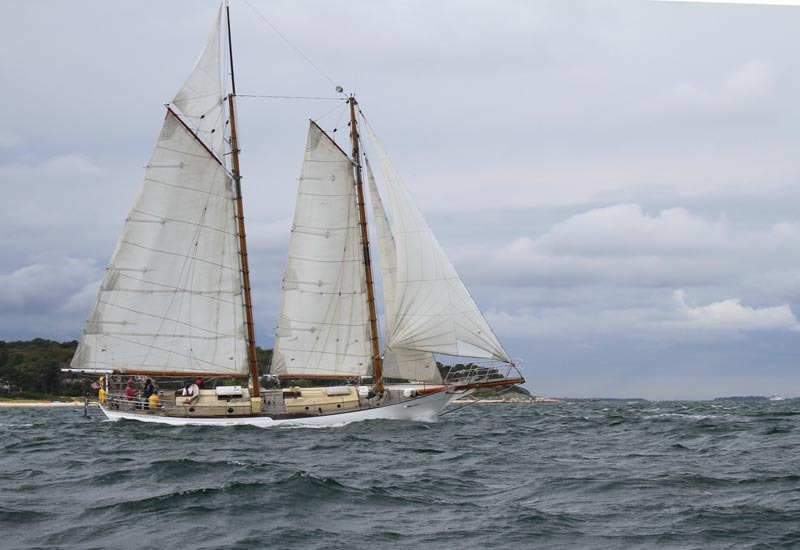 Sailing vessels need large crews: Time was when these were considered obsolete simply because of the size of the crews needed to handle their rigging. Modern technologies have silenced that objection. The Maltese Falcon (right), a high-tech 88 m sailing yacht capable of sailing at 13 kn requires a crew like that of a similar sized motor yacht. The Maltese Falcon employs a computerized mechanical control system for deploying and furling its square sails. Cool toys for the fabulously rich, but are these actually useful? Indirectly, perhaps, as test-beds for potentially practical technologies, like Heron's windmill. It's already been tried: During the 1970s there were times when petroleum really looked like becoming an intermittent resource, also. Along with the development of wind farms, there was serious consideration of commercial sail. 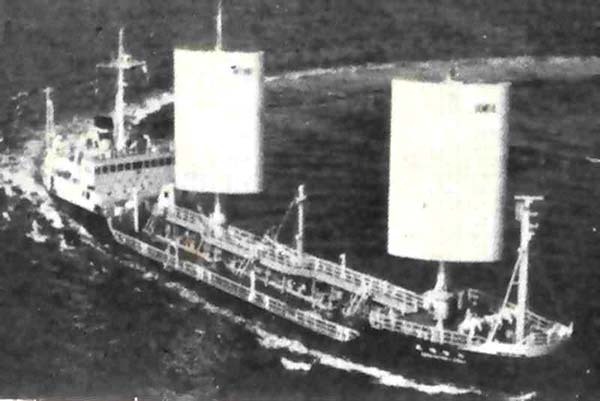 The era's poster child: the Shin Aitoku Maru, a small (298 ft.) tanker equipped with computer controlled folding sails that could be used in favorable conditions. Comparisons with a power-only sister ship indicated 10 - 15% reduction in fuel consumption. Not bad. The Shin Aitoku Maru engaged in trials for three years before being retired. There have been no follow-on attempts at a high-tech sailing freighter. What was wrong? Oil prices fell during the 1980s. Tall masts were found to be impractical in harbors that often feature low bridges. 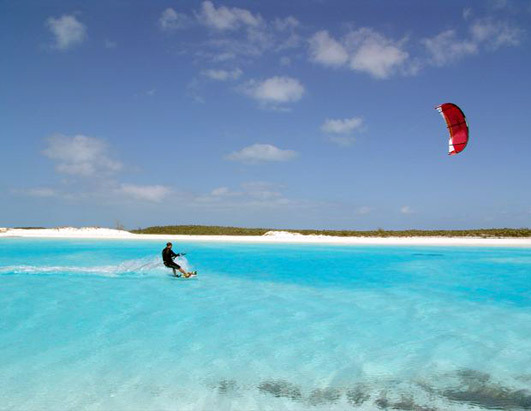 Currently, shippers are experimenting with an improbable solution to the latter problem: Skysails such as those used by kitesurfers. These can be deployed from virtually any ship during favorable conditions and retrieved before maneuvering in harbors. Moreover this takes advantage of a basic fact: The wind blows faster at higher elevations. The world requires shippers to adhere to precise time tables. Thus, for the most part, sailing remains the wind-power of the past and wind turbines the wind power of the future.